The weather forecast was calling for thunderstorms. It didn’t seem true since the skies were blue and the sun was shining in Tahoe. It was a perfect spring day. Grabbing the last of the gear we finished packing it in the car. The smell of pine was in the air and the radiating sun felt good shining down on our skin. It always seems odd pulling out of the driveway to go on a snowboarding trip in conditions such as these. Heading over Spooner Summit (US-50) and dropping down the mountain, a wall of clouds in the distance began to build. At this point it was evident, rain was soaking the valley. Thoughts of whether the trip would be rained out began to creep into our minds. About that time huge rain drops began to cover the windshield as we pointed the car south towards Mammoth Lakes, CA. The closer we got to our final destination the heavier the rain became while the mountains surrounding us got bigger. They began to touch the sky as the moisture filled the heavy clouds. Looking up towards the peaks the snow level continued to drop as freshies coated the higher elevations. After hitting the highway, we made the one and only turn off of 395 and headed west to Mammoth Lakes. The rain let up and the environment became quiet and peaceful. There was a sense of relief amongst the crew. We pulled into our lodging and began unloading gear from the car. In reality, it felt more like winter than spring and we were amped for the upcoming day at the resort. 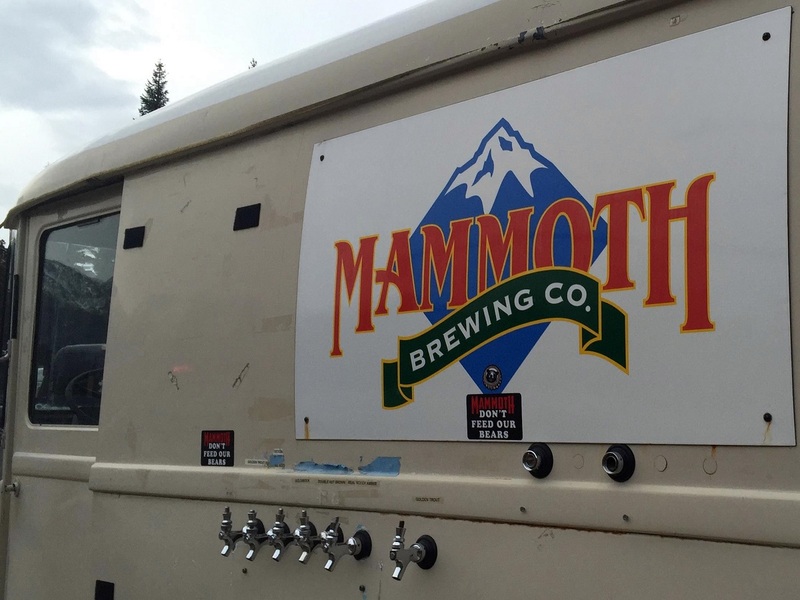 But first, when in Mammoth, Mammoth Brewing is a go to for some sustenance and to quench our thirst from the drive. Since our last spring trip they had relocated the tasting room and even partnered with a restaurant. We quickly threw all the gear in the house and went to check out the situation. The new location is very well done. There’s an immediate bright and outdoorsy feel when entering. The walls, floors and ceiling are decked out with pine wood, which give it a warm cabin-esque ambiance. Chase, the tasting room manager, was there to greet us at the door and to show us around the brewery. 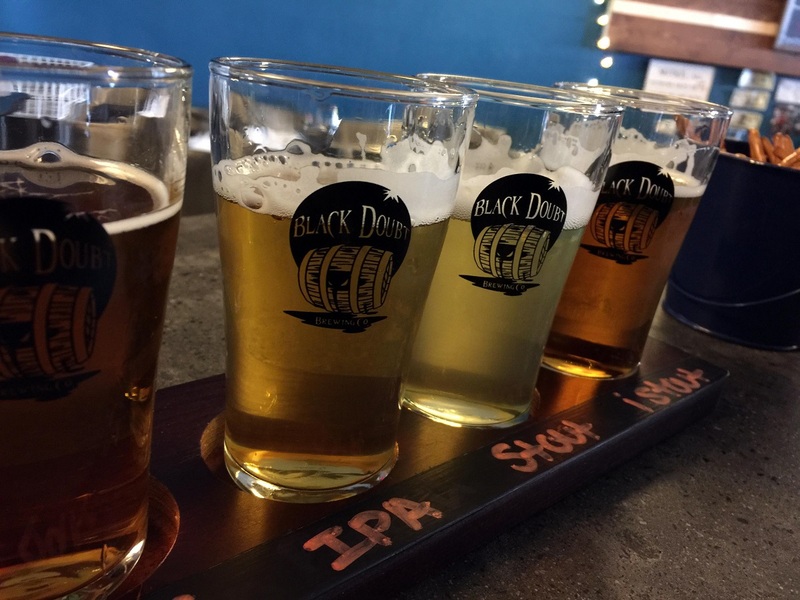 Like many breweries, they started small but they now brew over 8,500 barrels a year. Distribution obviously covers the Eastern Sierras and has expanded as far south as Los Angeles and all the way up to Reno/Tahoe. On tap they had a ton of experimental beers we’d not heard of and hadn’t seen in stores. One of the more interesting options was the Forest Nymph. Typically sour beer wouldn’t be the first on our list to try. Surprisingly, it was a good introduction into how good this type of ale can be when done correctly. It’s a nice solid beer flavor with a tangy refreshing hint of sour. It’s perfect for a summer day. One of the seasonals on tap was the Summer Triple (a Belgian style ale) which was created to pay homage to this time of year in Mammoth. It signifies the trifecta of activities during summer in this area, which are Hiking, biking and fishing. Once we finished a full tour of the brewery and sampling many of their offerings, Chase left us to our own devices. With beers selected, that meant it was time to order some food. Fortunately, the brewery partnered with the Eatery, which is right inside the tasting room. Until you do some research the separation almost goes unnoticed. After talking to a few locals we found out that this restaurant is owned by Bleu, another restaurant in town. This is one of those “matches made in Heaven!” Just like the beer, the food is no joke. We could’ve eaten here every night, it was that good! 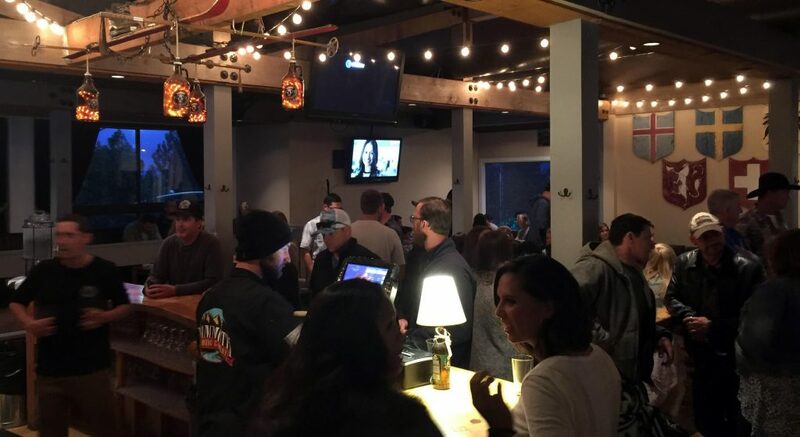 So, we have to preface this with a description…this night we happen to be lucky enough to show up while there was a wedding party of 100+ people AND the Golden State Warriors, NBA playoff game was on the TV! The place was hoppin’ and the atmosphere was live. We headed over to the counter to place our order. The server informed us certain selections were sold out. Since we were there late and they were packed, it was no big deal. There were plenty of interesting choices to choose from. Each item on the menu took a typical bar food and flipped it on its head with a clever, calculated culinary twist. Take one of their appetizers for example. It is called Chili Dusted House Made Pork Rinds. This dish is warm, crispy with a hint of salt-n-spice that paired awesomely with every beer on the menu. The Crispy Chicken is a take on the classic chicken & waffles, but instead of traditional, the chicken was on a bed of corn cakes! The Philly Cheesesteak took a different approach as well. Stacked with real pieces of steak and a creamy white cheddar cheese on a toasted bun, it was fantastic. From what we can tell everything on their menu is amazing. On our next trip we are definitely going stopping by Bleu, their main location. Until then, it was time to get a few hours of shut eye for the following day. Up bright and early it was bluebird skies and we were stoked! 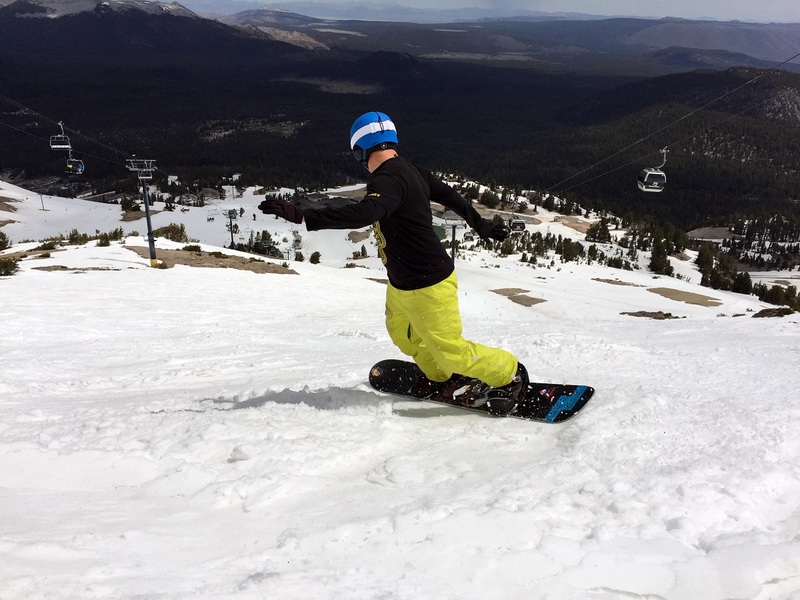 Today was the first day to to ride at Mammoth Ski Resort. First things first, we needed to fuel up with some healthy food to soak up the beer from the night before. 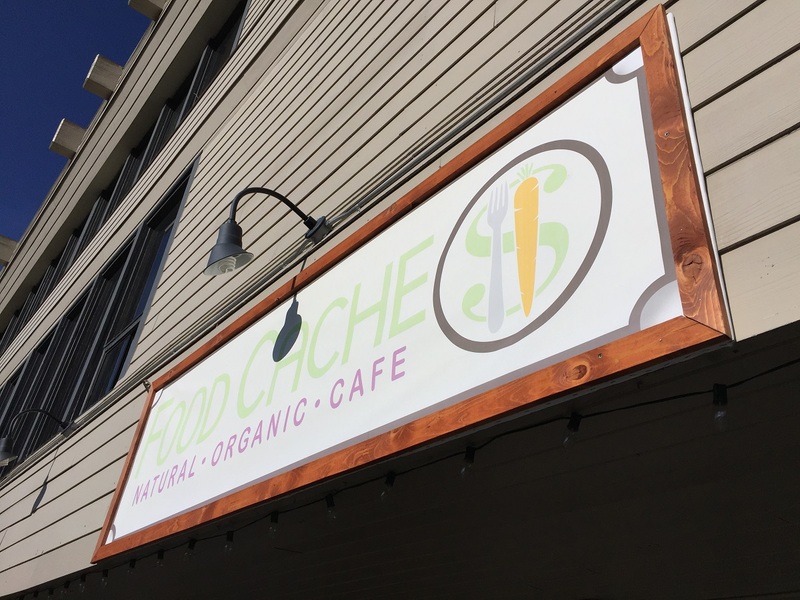 The locals mentioned there was a new hotspot adventurers hit before heading out for the day called the Food Cache. Instead of serving the typical low quality, high fat / high carb food served by many restaurants, owners Eric and Karl chose to serve nutrient rich food that they eat every day and make it taste good. Crazy concept right? The name Food Cache comes from the backcountry term that people use for their re-fueling / re-supplying stations. It’s very fitting since they provide food that re-fuels you for an active lifestyle. The best seller is the Amaze Bowl…again the name! It’s a cold breakfast made of acai, blueberry, strawberry, banana, coconut milk, peanut butter, strawberry, chocolate chips, coconut flakes, granola, and honey. After your first bite you feel guilty. Almost as if you’ve been tricked or served the wrong order. This has to be some kind of desert right? Wrong…it’s a super-charged bowl of protein, healthy fats and antioxidants that leaves you satiated and satisfied! From the Avocado Bowl to the Super Colada shake each item served will fuel you and taste great! They also designed their location to re-fuel customers in all aspects. If you got nowhere to be, need to study or just want to chill this is your spot. Not only is the food and drink bomb, but there’s free Wi-Fi and built-in plugs in the seating for USB cords. This means you can check in on social media, surf the web and charge up your gear while you eat and hangout in one of the lounge areas or at a table. Today we only had time for breakfast, but it was a great experience and we can’t wait to drop back by for lunch the next time we are around! Fully charged, we said our good-byes. 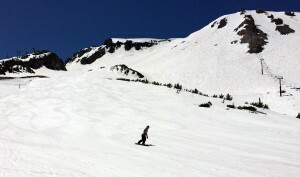 By Memorial Day snow in most parts of the country is long gone, but at Mammoth they aren’t even thinking about closing. You are asking yourself…did they say snow in May? The answer is yes we did…let’s not stop there. Try snow in May, June and July! 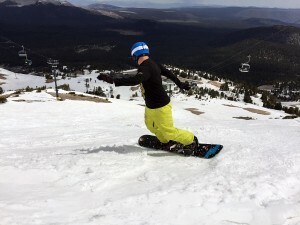 On a typical winter you can still ski or snowboard until July 4th. This year is no different! The question becomes why? Talking to Joani Lynch, director of Marketing, it’s simply a tradition. Dave McCoy the person who started the resort ran it less like a business and more as a place to hang out. This attitude still resonates to this day. Immersing ourselves in that vibe we hopped on the chairlift and began our day around nine. At that time the snow was the softest off the front of Chair 3, known as Facelift. Creamy and carve able we made lap after lap and got the most out of it. 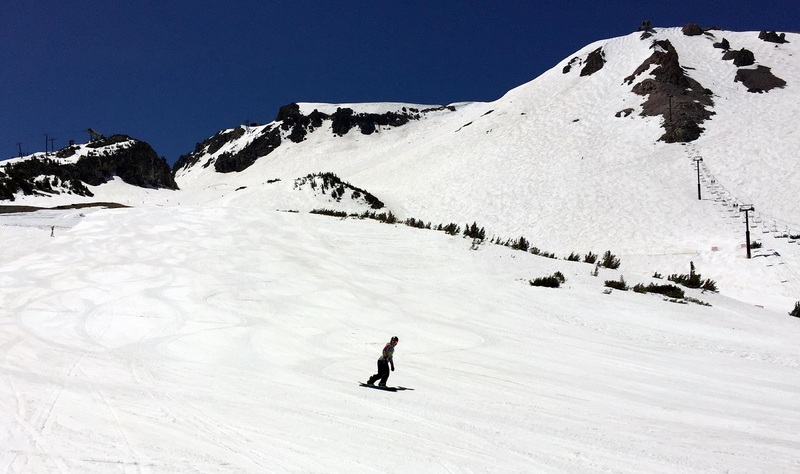 As we’ve discussed, spring skiing is all about reading the snow. Armed with this information, we knew it was time to head up to the summit. All the locals said that regardless of your ability the summit is worth a visit even just to take in the view. Words and pictures cannot express how beautiful it is. 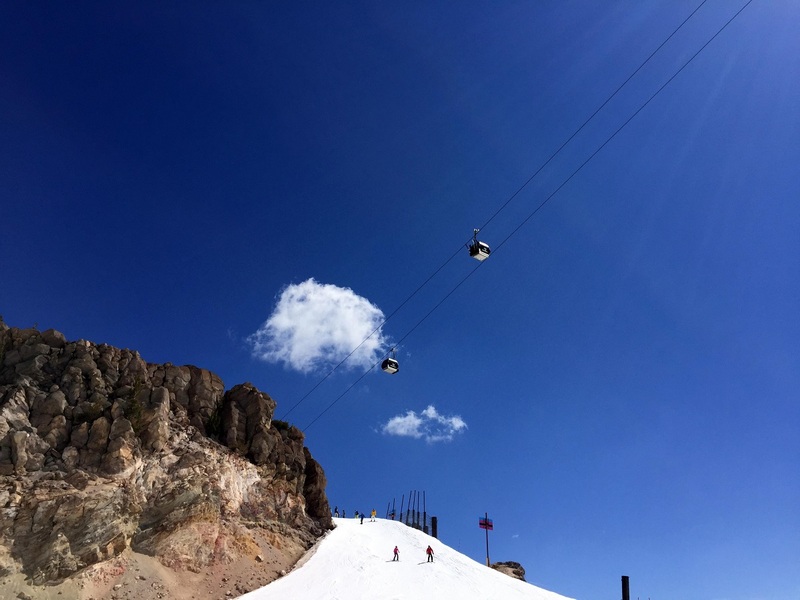 Whether or not you ride or ski, if you find yourself in Mammoth Lakes put this on your list of things to do. 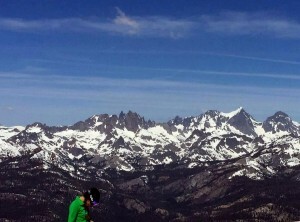 From the top we decided to drop into Cornice Bowl. By this time of year the snow is perfect for anyone who wants to step up their steepness game. Soft and groomed it was great practice or you could really let er’ rip! Bombing this line gets the adrenaline pumping and the heart beating. This is exactly what the doctor ordered! Quiet and unassuming from the outside, Mimi’s Cookie Bar is a must stop if in Mammoth Lakes. Baking cookies started as a hobby but once Mimi moved to Mammoth Lakes she was looking for a job that she’d enjoy. So, why not follow her passion? This is when the idea of a bakery was born. Now here at Local Freshies, we’ve been to many bars…but we can say this is our first stop at a “cookie bar.” Having a sweet tooth and intrigued by the name we had to see what Mimi’s Cookie Bar was all about. Walking through the door it immediately feels homey and inviting. It’s comforting like your grandma’s kitchen with a younger, hipper vibe. Mimi met us upon arrival and it was evident who created the atmosphere. She’s an ex-competitive snowboarder with a passion for baking! Sitting down, the first question was about the origin of the name. “Mimi” is obvious, and it turns out the rest came after securing the location. She credited her husband, Delaney Council, for naming the bakery. It’s simple…they serve cookies from behind counter, which in definition is also known as a bar. Yia Yia (pronounced Ya Ya) cookie which means grandma in Greek…this recipe specifically comes from her grandma. It is the classic Kourambiethes Greek cookie made with organic ingredients. Best Friend Ever which contains peanut butter, chocolate chips, and sea salt. This is one of Mimi’s personal favorites. Dad’s Coconut Chocolate Chip a soft chewy chocolate chip with HUGE coconut flakes in it. It really works and it’s so good! Like all great ideas sometimes necessity is the best form of invention. Mimi was faced with a problem. In her recipes she began to notice she had lots of almond waste. Not a big fan of waste, she came up with a plan. Instead of throwing those out they figured out a way to use the excess. Again, husband Delaney, comes to the rescue! Use the ingredient to make Florentines. The result, a newest best seller was born…Caramel Florentines. In our opinion this is the most decadent dessert you’ll ever have. 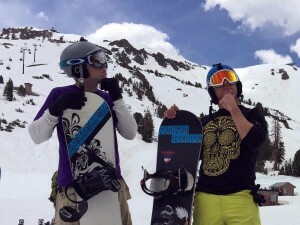 This was overall a great experience and a definite reason to come to Mammoth. But, don’t worry; if you can’t make it Mimi’s got you covered! For those who’d rather be pampered, you can order her delicious goodies online daily. If you are a do it yourself kind of person, you can always purchase her cookbook. With the sun setting it was time to head over to the newest brewery in the Eastern Sierras. Each ski town has its own character and style. but the people that call these places home are all a hearty bunch that follow their passions. It’s about making your own path no matter how difficult it is. Drew and Kerissa Wallace, the owners of Black Doubt Brewing are an embodiment of this. 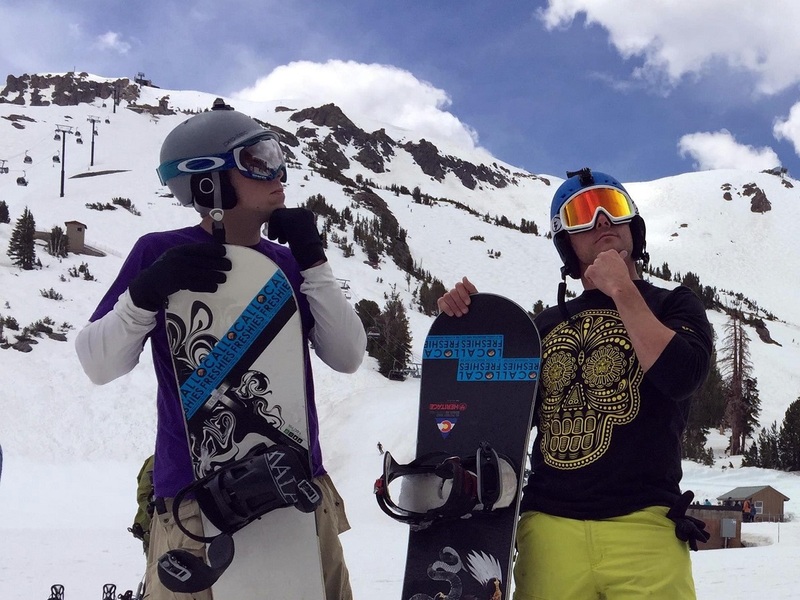 Arriving ten years ago in Mammoth to follow the snow, their love of brewing beers never waned. Finally deciding to go for it they opened Black Doubt brewing. Looking to highlight their use of an electrical brewing system the name “Black Out” came around which evolved into “Black Doubt.” Their location makes you feel right at home even if it’s your first time there. Almost like you were at your own local watering hole. Of course it’s all about making “beer for the people” and each beer they serve is amazing. Their beers have some really clever names and taste great. Many are named after terms only the local’s know. So you’ll have to buy a round of beers to get the scoop behind the names. So include the “Mountain Wookie” and also the “Yeti Charmer.” Be warned that there is a good chance each time you visit their beer selection will be vastly different. So, if you enjoy what they are serving you better drink up and get a growler to go! It’s impressive to see such a small outfit hangin’ in with the other brewery in town. These guys really are doing it right and there’s even talk of distribution in the future. Hopefully, we get the 411 first so be sure to check back with us for updates. Through out our trip we stopped and checked out a few different spots. 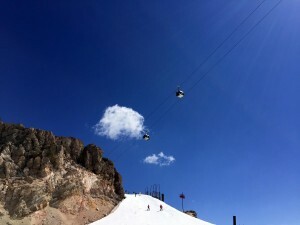 Toomey’s is cool if you want a good bite to eat on your way down from the mountain or staying near Mammoth Village. Stellar Brew is an awesome joint filled with great café food and an amazing patio. The one spot we checked out that seemed to do things a bit differently is Black Velvet Coffee. With its modern décor it could exist in any major city, but at the same time had the style of Mammoth. Pulling up to the counter we were shocked to hear that they do pour over and immersion methods to get a cup of ‘jo. Having never tried the immersion method that was the option we took. Creamier than a pour over and more like a refined French press it was simply fantastic! The next thing we were impressed by is that there is only one size of Cappuccino. This tells you they are serious about their craft. 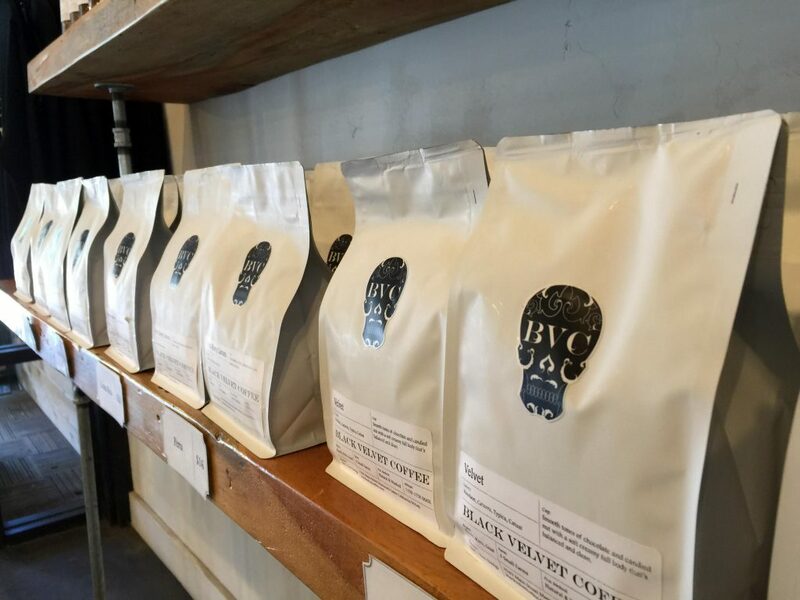 If you like coffee you’ll love this place. If you aren’t a coffee drinker they also have a good selection of beer and wine as well. With Mammoth Mountain being open until July 4th there is no better time than now to come down and visit. 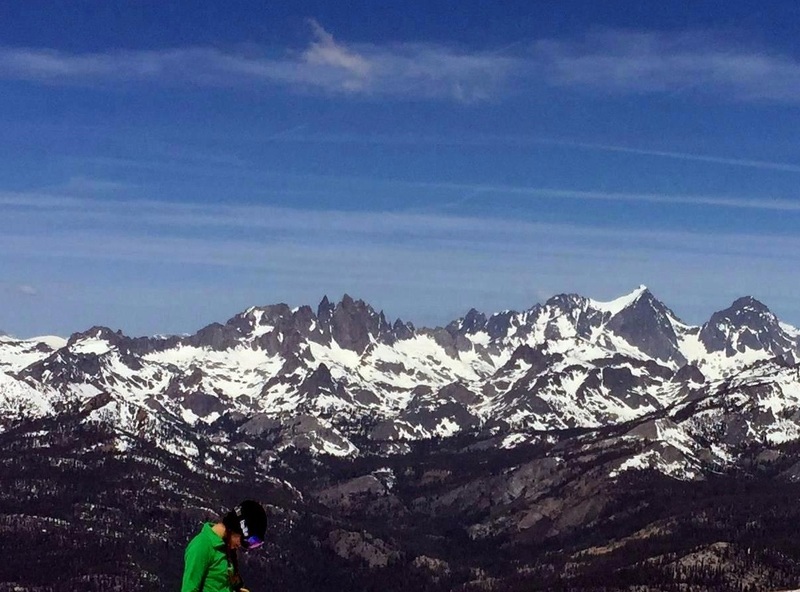 Many people visit Mammoth Lakes, CA each year to enjoy Mother Nature and the Great Outdoors. This is one of the greatest places on the planet to do so, but as you’ve seen there’s much more. 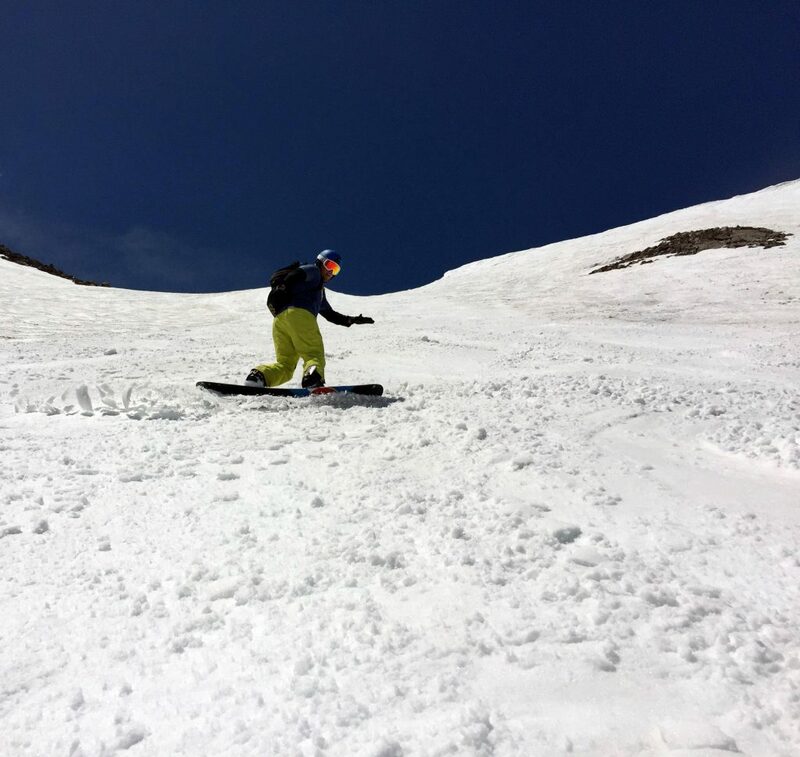 The mountain is staying open until July 4th so you still have time to get down and make some turns! 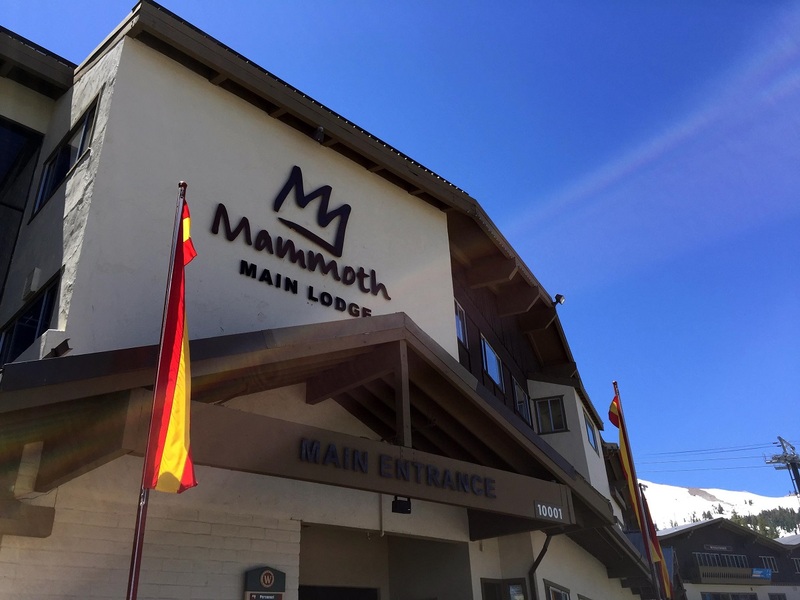 Regardless, next time your in town swing by some of these local’s favorites to give your trip a boost and experience Mammoth like the locals! Pingback: 2017-18 Ski Season Record Setting - For the Midwest & East!